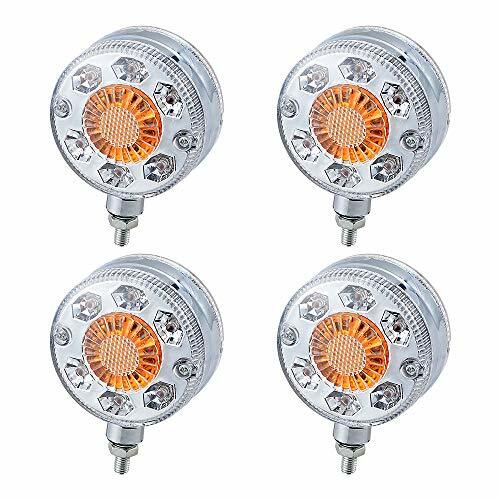 Specifications: * Condition: 100% Brand New * Package included: 4X 24-LED Side Marker Light * Size (As the picture shown): Diameter: 3" (8 cm) * Mounting Hole: 8mm * Lens Color: Clear + Amber * Light Color: White + Amber + Red * Voltage: 24V DC * LED: 24 X LED (each light) * Wattage: 12W * IP Rate: IP 65 * Material: ABS Housing + PC Lens + LED * Weight: 560g * 3 wires connection: Black for negative, Red for corner light positive, Yellow for turn signal positive Features: * High power 24-LED double face sider marker light * Light function as Corner, Running, Stop with Turn Signal light. 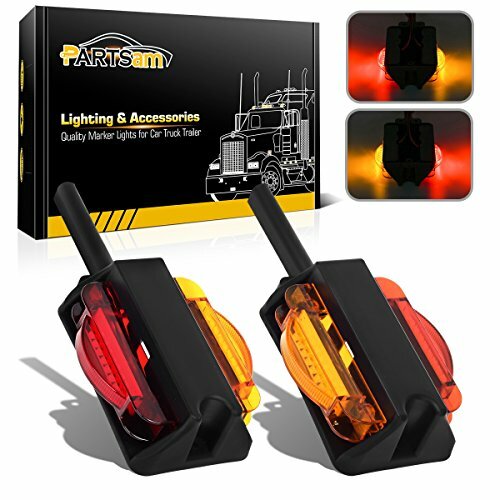 * Made of high-quality ABS housing with bolt on mount * PC lens and housing ultrasonically welded together to ensure a permanent and waterproof seal * Super bright LED provide maximum visibility and safety. 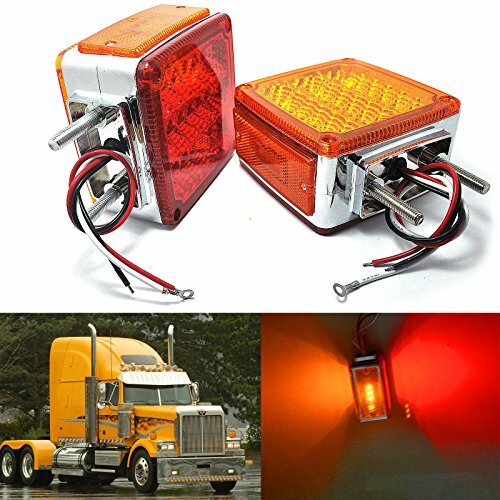 * Works as Tail lights, Turn signal lights, Roof lights, Side marker lights and Corner lights. 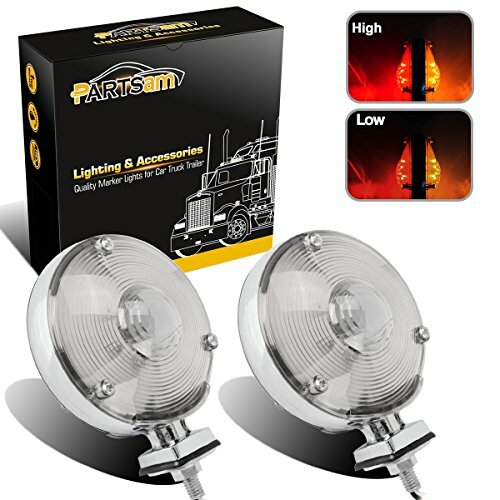 Fitment: * Fits for Heavy duty application with DC 24V * For Heavy duty truck, tractor such as Mack, Kenworth, Freightliner, International Harvester, Peterbilt ,Western Star, Volvo, Paccar etc. Note: * Minor drilling may required for installation * Please check all Description before ordering! 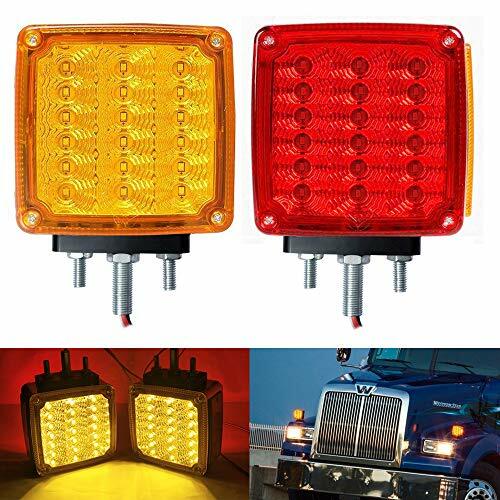 Specs: - Double Faced LED Pedestal Mount Stop Light - Function: Stop/ Turn/ Tail/ Parking/ Brake/ Lamp & Side Marker Clearance Light - Fit: Truck, Bus, Trailer, Tractor, Excavator, Van Camper, Bulldozer, Crane etc. 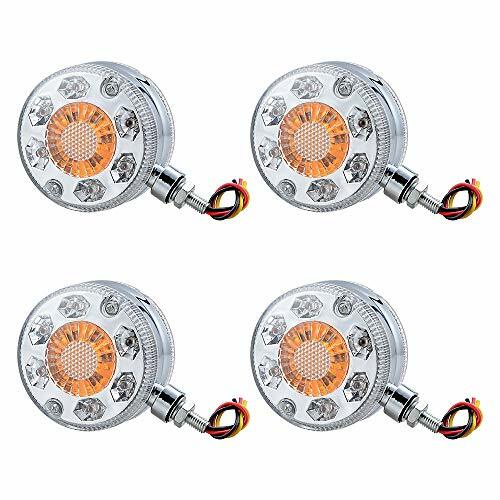 - Voltage: DC12V - Color: Red + Amber - Material: PC(Polycarbonate) Lens & Chrome Finished Housing - Size: 4.60" x 4.50" x 2.50" 3 Wires Connection: - White wire- Negative - White + Black: Full lights on in 50% low brightness. - White + Red: Front & Back lights on in 100% low brightness. 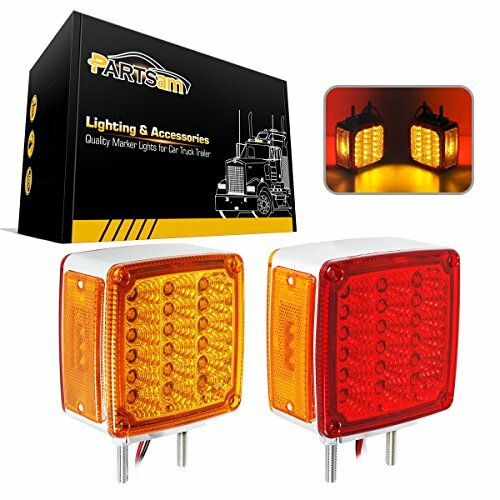 Features: - Faster on/off response time. - Reflector design, lower power comsumption. 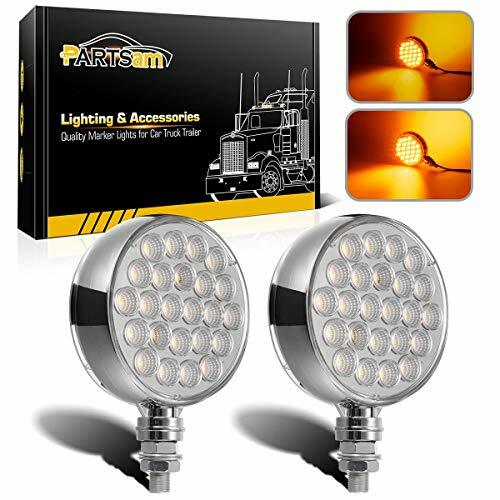 - Heavy Duty Chrome Plated Housing, Double Stud Mounting, Reflector Design. 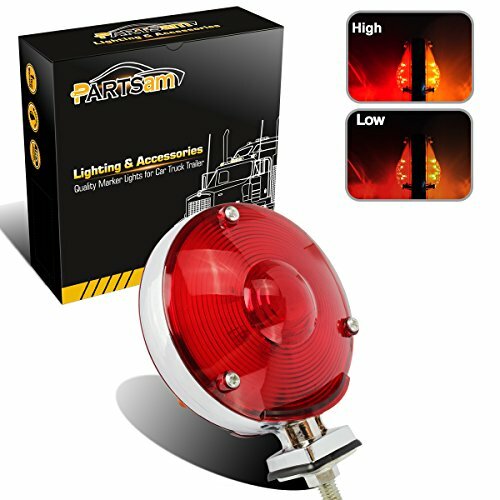 - LEDs have no filament, therefore are extremely resistant to shock and vibration. - LEDs have less current draw, resulting in increased battery and alternator life while allowing more power for other vehicle requirements. - Epoxy encapsulated electronics protect the lamp from damage caused by chemicals and moisture. - Installation friendly, no modification required. 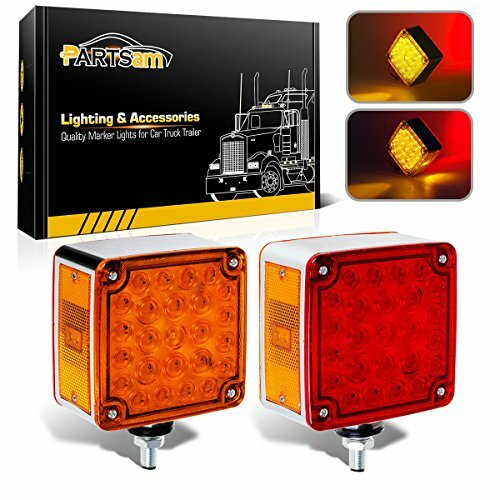 Package Includes: 2 x Amber/Red Double Stud Mount Pedestal Cab Fender Dual Face Stop Turn Signal 39 LED Light.